Many people email me and ask about the bikes I create, the parts that I make and offer and many also ask for advise on their machines. I am still learning after almost 4 decades of being into Motorcycles and thats what I love about it. Motorcycles will always be a big part of my life, i have met many people from all over the Globe, I have also built machines and sent to so many far off countries, it simply amazes me sometimes, but this is my passion and I continue to feed my passion with these fascinating 2 wheeled machines. 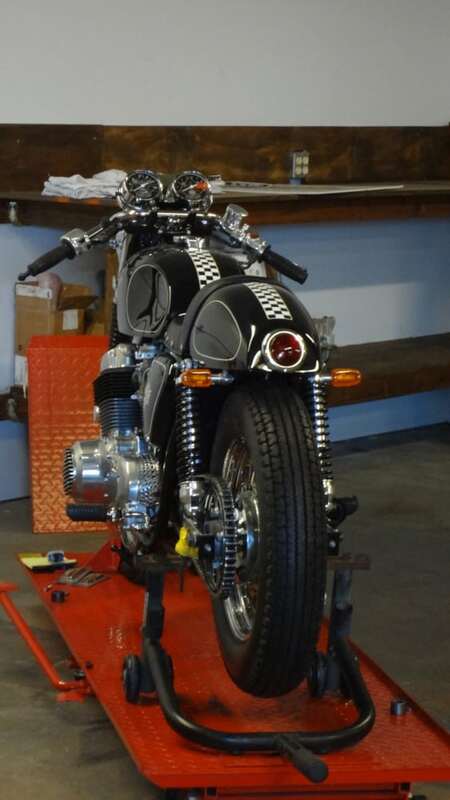 Below is the Speedmaster cafe bike that I created, it now resides on the otherside of the world and in fact, I met the owner this year as he travelled the USA and he came to one of our 59 Club monthly meets, so always cool to meet clients. If you need help, advise etc, please feel free to drop me a line at carpy@carpyscaferacers.com as this is what I do and if I can get your Motorcycle back on the road, it makes me feel good and you great. keep doing what you are doing, take your time, building bike is a learning curve that takes a long time to conquor and I am still trying to get to that stage after all these years, but its a fun journey and hope that you stick with me through it. This entry was posted in Blog and tagged 4 into 1, 59 club, 750-4, ace cafe, Brands Hatch, brat, cafe racer, Cafe Racer parts, carpys cafe racers, cb750, cb750k, chopper, custom, drag, Honda, hot rod, inline four, isle of man, japanese motorcycle, Mallory Park, Performce parts, rockers, snetterton, sohc, superbike, ton up, tt, yoshimura.